Still from "Fry & Leela's Big Fling," one of the 13 episodes in season 7B of "Futurama," which will air from June 19-Sept. 4, 2013. It's the end of the road yet again for "Futurama." The second half of the final season of the animated science fiction series launches tonight (June 19) on Comedy Central, beginning the latest swan song for a show that's famous for coming back from the dead. "Futurama" was created by Matt Groening, the man behind "The Simpsons" and the "Life in Hell" comic strip. The show centers on the life of Philip J. Fry, a a 25-year-old pizza delivery boy who accidentally freezes himself on New Year's Eve in 1999 and wakes up 1,000 years later. Fry lands a job with an intergalactic delivery company called Planet Express. He travels throughout the cosmos with its eccentric crew, which includes, among others, a one-eyed mutant named Leela, the foulmouthed robot Bender and staff doctor John Zoidberg, a lobster-like alien who knows absurdly little about human physiology. "Futurama" has gained a cult following over the years and won a number of awards, including the 2011 Primetime Emmy for best animated program. Still, the show has had to fight and claw for a spot on TV over the years. "Futurama" debuted on Fox in 1999, airing for four seasons before production stopped in 2003. Reruns of the show were syndicated on the Cartoon Network, and then "Futurama" came back in four new direct-to-video films, which were released from 2007 through 2009. After reaching an agreement with Fox, Comedy Central broadcast those four movies as 16 half-hour episodes, which became Season 5 of "Futurama" and aired in 2008 and 2009. Comedy Central eventually picked the show up in a more conventional way, airing the 26 new episodes of Season 6 in 2010-11. The first 13 episodes of Season 7 aired last summer; the last 13 episodes (known as Season 7B) kick off tonight and run through Sept. 4. Comedy Central announced earlier this year that it would not renew "Futurama" for another season, apparently ending the show's 140-episode run. The decision did not come as a great surprise, Cohen said, noting that he and the other "Futurama" folks have dealt with bad news before. "The shock to me each time now is when we come back, not when we get cancelled — I expect to get cancelled," Cohen said, adding that he views the current season of "Futurama" as a sort of "bonus round." "We thought we were done for — what was it, nine years ago at this point? — when Fox cancelled us," he said. Cohen gave a few hints about what viewers can expect in the series' final 13 episodes. For example, guest stars will include George Takei — Mr. Sulu from the original "Star Trek" series, who's making his fifth appearance on the show — comedian Sarah Silverman and NBA Hall of Famer Larry Bird, among other folks. 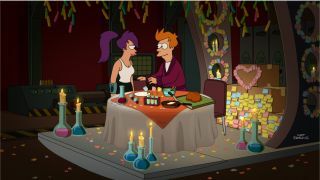 But the highlight for most "Futurama" fans will come in the very last episode, which will see Fry and Leela cement their love in a highly anticipated wedding. Don't worry: The nuptial news is not too much of a spoiler, Cohen stressed. "That's not really the ending; that's the beginning of their troubles," he said. "There will be a giant sci-fi extravaganza associated with it, and that's the part I'm not going to tell you." "If this is our final, final episode, I feel very proud ot it," Cohen added. "I think it will be a very nice way to go out."